Rabindranath Tagore’s short story “Kankal” (“The Skeleton” , 1892) is a ghost fantasy about a young widow and her tragic notions about love, life, and death. This story served as the basis for the 21st episode, “Kankaal” , of the anthology television series Stories by Rabindranath Tagore (2015), which was under the general directorship of Anurag Basu, with this episode scripted by Bijesh Jayarajan and directed by Sunil Subramani. Like many of Tagore’s stories covered in this series, “Kankaal” concerns the perspective of a young woman living within the confines of a restrictive social sphere. This is told in a story-within-a-story format. In Tagore’s original tale, the outer story is told as a first-person oral account of a college student who encounters a ghost in the form of a young woman who then orally relates to him, and the reader, her own story. In the filmed version rendered by Bijesh Jayarajan and Sunil Subramani, these two accounts are partially dramatized. The core element, of course, is the ghost’s account and the wry and melancholic fashion in which she tells it. The story begins with new college student Arup (played by Veer Rajwant Singh) arriving at his over-subscribed hostel looking for the room he thought he had arranged. 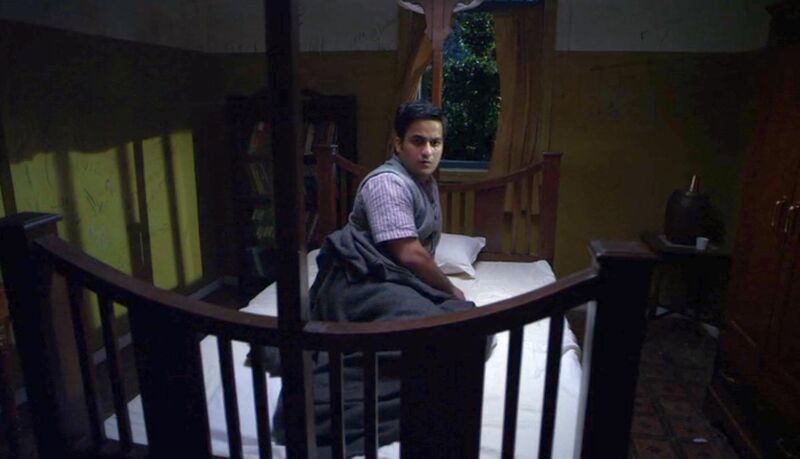 The proprietors hastily give him their last room, one that was last occupied by a deceased medical student. When Arup goes to the room, he is disturbed to find it disheveled and with a skeleton hanging in the clothes cupboard. After the embarrassed proprietors clean out the room and remove the skeleton, the travel-weary Arup settles into the bed and starts to snooze. However, he is soon startled by the sounds of an invisible female ghost who tells him she has come looking for her skeleton. Arup is frightened and tells the ghost that her skeleton has been taken away. But the ghost decides to hang around anyway – she has been dead and weeping for thirty-five years and misses talking to people. So she says she is going to insist on telling him her story, and he will just have to listen. Up to this point we are more than one-third of the way through the tale, and this telling of the outer-story has been rather awkward and less than compelling. It is only when we get to the inner story of the ghost that things start getting interesting. Arup now looks out his window and sees that the sun is shining, giving him and the viewer the hint that he has entered into the ghost’s story (or perhaps into a dream). The ghost, Mrignoyonee  (Anupriya Goenka), is now visible to Arup and the viewer, and we can see that she is a beautiful young woman. We will also soon see that in the dreamworld that Arup has just entered, he is invisible to others in that world – he is an invisible witness – but the film viewers often see him standing unnoticed in the background of a scene. Mrignoyonee tells him that she died when she was twenty-six, an age that I (and also F. Scott Fitzgerald ) feel is when youthful and mature beauty and ability combine to reach their pinnacle. Arup is stunned by her loveliness, and it is evident that Mrignoyonee is fully aware of her magnetic allure. Mrignoyonee begins her tale by telling him that she was forced into marriage as a child-bride to an older man she abhorred. After his early death, she was condemned by Hindu custom to live in isolation from the rest of society and only wear drab, white mourning clothes. So she wound up living as a recluse with her brother, a committed lifelong bachelor, in his wealthy estate home. In her lonely world inside the estate walls, she had noone, not even have girlfriends, and she had nothing to do but obsess over her own beauty and imagine how the whole world – man and nature – was overcome by the magnificence of her pulchritude. Interrupting this narcissistic solitude, Mrignoyonee’s brother’s only friend, Shekhar (Kunal Pant), who is a medical doctor, comes by their house one day when Mrignoyonee happens to have a fever, and he gives her some treatment. She is delighted to have a man observe her beauty, and she assumes that the doctor is staggered, like all men must be, by her overwhelming charms. 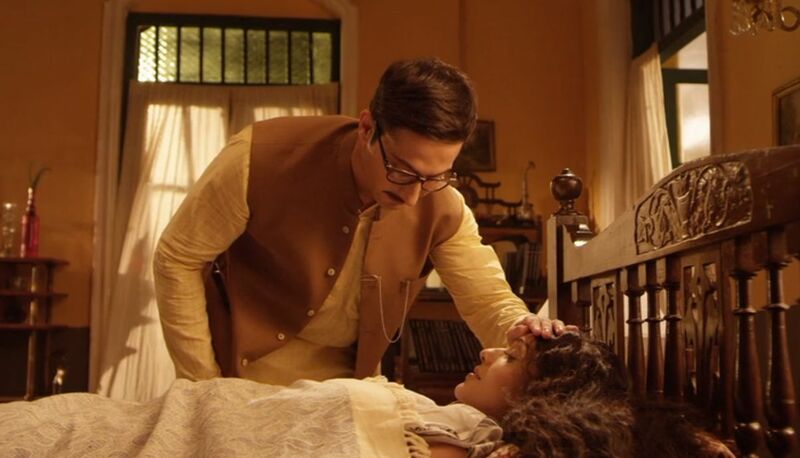 Interestingly, Shekhar wears horned-rim glasses, which is a remarkably common garb among principal male actors in this whole Tagore series. I am not sure if this is done to accentuate visible distinctiveness among the male principals, or if it is done to accentuate the contrasting comeliness of the female lead. In any case, both of these effects are in evidence here, and the dreamy recounting of Mrignoyonee’s flirtation-inspired interactions with the doctor is the most enchanting part of this film. Soon Mrignoyonee is flirtatiously inventing all sorts of little maladies in order to attract the doctor’s attentive treatments. Her only regret is that as a widow, she cannot dress up in fine clothes in order to further dazzle him. Eventually, Shekhar is invited by Mrignoyonee’s brother to open up a clinic in their estate, and when he does this, it gives Mrignoyonee further opportunities to hang around Shekhar and flirt with him. Soon Mrignoyonee starts frequently visiting Shekhar’s clinic office and asking him questions about the chemicals and serums he has stored there. In particular, she was curious about the ones, like arsenic, that could be lethal in higher doses. This reflected the fact that Mrignoyonee’s life had been so isolated that she could only think in terms of abstractions – like love, life, and death. Shekhar would politely answer her questions and put up with her flirtatious pestering. But Shekhar, while evidently charmed by Mrignoyonee, always maintains his courteous distance. Mrignoyonee just assumes that the combination of Shekhar’s inherent timidity and social conventions stop him from expressing his true feelings about her. However, Shekhar is not the romantic type, and he has more practical things in mind. One evening Mrignoyonee sees Shekhar going out in a carriage, and she discovers that he has gone out to arrange his marriage to a wealthy heiress. Hiding her disappointment at this disturbing news, Mrignoyonee gets her brother to stage a lavish wedding party prior to the wedding ceremony. At the event, when her brother and Shekhar are sharing a drink, she secretly spikes Shekhar’s glass with a lethal dose of arsenic. Then she dresses up, for once, in colorful wedding clothes and goes out into her private garden and lays down on the ground after having consumed her own potion. At this point in the story, we now see Mrignoyonee and Arup, the two silent witnesses, standing in the garden and looking down at her double in the form of the unconscious, prostrate body of Mrignoyonee, the dramatic subject of her own tale. Mrignoyonee ruefully reflects to Arup on the failure of her narcissistic scheme to join up with Shekhar in an unfettered afterlife. Instead, her journey into death only led to lifeless emptiness, and Shekhar was nowhere to be found. When she next woke up, she tells him, she found that she was a lifeless skeleton being examined by medical students. With Mrignoyonee’s story now completed, Arup wakes up in the morning alone in his room. There is no sign of the beautiful ghost who had enchanted him overnight with her dolorous tale. Tagore’s story, as told through Mrignoyonee’s almost self-mockingly narcissistic recounting, has its satirical elements, but it has a serious side to it, too. Apparently Indian widows were traditionally kept in such confinement as to be almost cut off from life, itself. This was an aspect of the general restrictions traditionally placed on women that Tagore criticized. The way out of this cultural morass was not to seek narcissistically focused salvation in some imagined afterlife; it was better to embrace life and seek whatever improvements can be made through vital human engagement. This production, “Kankaal”, of the story does have some weaknesses. The outer story of Arup is too mockingly exaggerated and overacted; and this makes that story, which excessively occupies more than one-third of the running time, uninteresting. In addition, this portion annoyingly employs a shaky hand-held camera to depict Arup’s agitated state when he encounters the ghost. However, these defects are more than compensated for by the lyrical and dreamy presentation of Mrignoyonee’s story, which features the hypnotically ambiguous performance of Anupriya Goenka in that leading role. Her dreamy and enticing eyes and smile are suggestive of that mysterious other world from which she comes. Rabindranath Tagore, “The Skeleton”, Mashi and Other Stories, The Literature Network, (1892/trans. 1918). Durga S, “The Uncanny – Stories by Rabindranath Tagore (9)”, Writersbrew, (9 March 2016). At one point, though, she refers to herself as “Roopmati”.